"Flower blossoms are one of the best expressions of the beauty of nature," says Beijing-born artist He Si. "They might look fragile and delicate from the outside, but their dynamic colors reveal an inner power and energy." 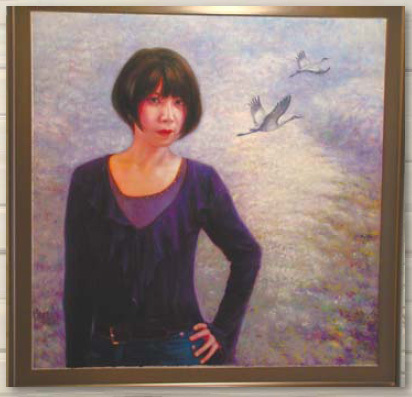 Communicating with Flowers is He's second solo exhibition of oil paintings of irises at the Zezhong Gallery, since she moved to the United States in 1992. He fell in love with irises at first sight shortly after she arrived in New Mexico, from Beijing 17 years ago. She believes they evoke a stronger emotion than other flowers. "Irises have exaggerated forms and colors. Their soft textures and see-through petals convey a sense of clarity and simplicity far beyond their exterior beauty," she says. Her super-realistic paintings are influenced by the works of female artist Georgia O'Keeffe (1887-1986), who played a leading role in the modern art of America and is famed for her depictions of flowers, rocks and natural landscapes in northern New Mexico. As well as integrating oriental philosophy in her works, He divines the personality of women at different ages in irises. "As the sun's light plays its games on petals, you can see the innocence and sweetness of a teenager, the charisma and sophistication of a woman marching into her 30s, and the grace of an elder woman as her hair becomes gray and her skin wrinkles," she says. "I feel like I am a part of the iris, or somehow, within the iris. This feeling is unforgettable and I think that this deep connection is very important to my success as an artist." Her comeback to the domestic art scene is a breath of fresh air after the shocks and repetitions of many contemporary artists. "I don't paint to cater to the market, rather the market adjusts itself to me. I think an honest painter who brings out the true beauty of art can always find his or her place," she says. He knew she would pursue a career as an artist at a young age. She demonstrated exceptional artistic talent and began studying formally at the age of 12. Three years later, she secretly sent several of her favorite artworks to galleries. She enrolled in the Central Academy of Art and Design in 1982. Majoring in design, she developed an innovative approach to art works, which boldly combined Eastern values and Western styles. Upon graduation, she became an associate professor at the Fine Arts Department of Beijing's Central University of Nationalities. She rose to fame in domestic art circles for her surrealistic and naturalistic ceramic figurines, including Flame, a first prize winner at the China Ceramic Art Exhibition in 1991, and Chain, which received the Medal of Excellence at the Invitational Art Exhibition in Singapore in 1992. She taught at the University of New Mexico as a visiting scholar for three years. Now living in California, she continues to integrate and recreate her own stylistic tradition, while exhibiting in China, Japan, the US, Singapore and France. Her show at the Zezhong Gallery is from July 13 to 31.